Ever wondered which craft you could do to either keep yourself busy, or make gifts? I've always liked the appeal of mosaics and I'm sure you will too. That's if you like getting your hands a little dirty. I've long admired their complex-looking features, only to discover they aren't that difficult. I found this book very inspiring and it won't be long before I get myself kitted out with the necessary gadgets. By decorating simple objects such as flower pots or bathroom accessories, or making mirror frames and lampshades, there is plenty to try your hand at creating. A personally made gift is so much more meaningful. So, don't throw out any of those old and chipped mugs or plates as you might have a new use for them. And, this will make searching out garage and yard sales all that more worthwhile. There is plenty of time ahead of Christmas to try your hand at this pretty craft. 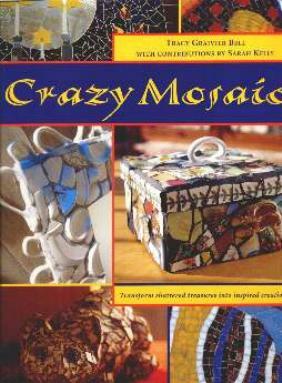 CRAZY MOSAIC may be purchased and/or ordered through your local bookstore. Conclusion - Great if you're looking for a new hobby.